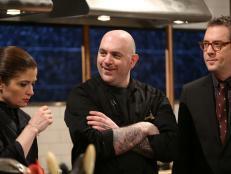 Watch an all-new episode of Chopped After Hours, featuring April Fools' Day-inspired mystery basket ingredients. 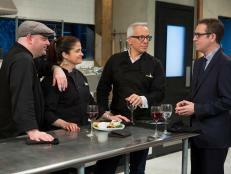 Chopped after hours host Ted Allen discusses the April Fools day ingredients with chefs: Amanda Frietag, Geoffrey Zakarian and Alex Guarnaschelli, as seen on Food Network's Chopped After Hours, Season 23. 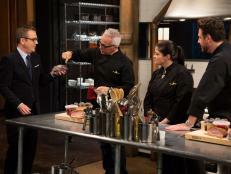 The chefs of Chopped were sure surprised to see basket ingredients in disguise in tonight's April Fools' episode. Presented with ingredients that appeared to be peas and carrots, grilled cheese, tomato soup and milk, what they actually had were candies, pound cake, strawberry puree and buttermilk. 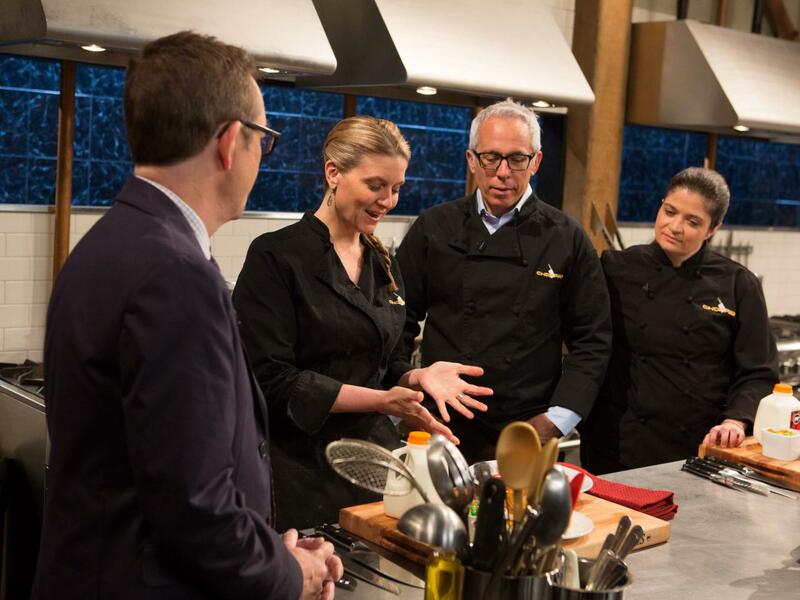 After the episode, the judges — Amanda Freitag, Geoffrey Zakarian and Alex Guarnaschelli — face the dessert round in an all-new Chopped After Hours, cooking with the same deceiving ingredients. "I have great news! We're bringing in massage therapists," says Ted. "I've also got vintage Champagne." But before he goes any further, he blurts out, "None of that is true. It's our April Fools' episode!" The baskets were designed to fool the chefs, but the judges feel it's their duty to bring that same spirit to their dishes. "It's up to us to have our own version of a reaction to April Fools’," says Alex, who’s got a few tricks up her sleeve — although Ted may have an even bigger trick up his. "Maybe it won't be strawberry shortcake, but it will look like one," says Alex when Ted sees she's making biscuit dough. But hers straddles the savory line with fresh tomatoes. "It's more like a sherbet," explains Amanda of her strawberry and buttermilk ice cream sundae flavored with pink peppercorns. 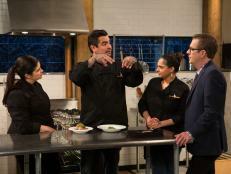 "There are no sure bets in the Chopped kitchen," Ted says, playing around with her pronunciation of "sherbet" (although it is a valid point). "It needs sugar and it needs love," says Geoffrey of the spiced syrup he's made from melting down the candies to use in his Eton Mess. "Both of which I provide," he suavely tells Ted. But the biggest joke of all is the prank Ted pulls on Alex, which has her running out of the pantry. "I didn't think I was going to get you," exclaims Ted to a visibly surprised Alex. "I can't handle anything," she screams. 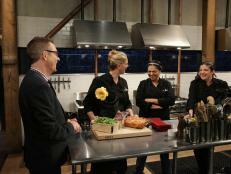 Watch the video above and then browse behind-the-scenes images for an insider's look at the cooking. Start a conversation with fellow fans and tell FN Dish in the comments below how you would have approached this basket: What would you make out of peas and carrots (candy), grilled cheese (pound cake), tomato soup (strawberry puree) and milk (buttermilk)? 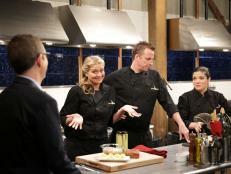 Watch the latest episode of Chopped After Hours and get the inside scoop on what the judges made with the appetizer baskets from the All-Stars finale. 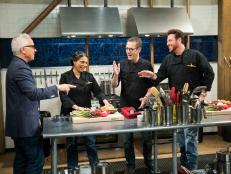 Watch a new episode of Chopped After Hours as judges Scott Conant, Maneet Chauhan and host Ted Allen try cooking a mystery basket from the Wild Ride episode. 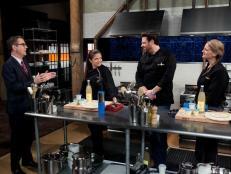 Watch as Chris, Alex and Geoffrey take on the entree round from the Chopped Bizarre Baskets episode in an all-new After Hours.